Mt. Holly, NC (CNN) – President Obama visited the politically important state of North Carolina to release the latest initiative in his strategy to lessen America’s dependence on foreign oil. The initiative is aimed at increasing alternatives to oil and improving fuel efficiency in vehicles. It includes accelerating production of alternative-fuel vehicles and offering a $10,000 discount in the form of a tax credit for purchasers of cars with clean and advanced technology. North Carolina, which Mr. Obama narrowly won in his 2008 bid for the presidency, is a key battleground state. It faces an unemployment rate of 10.4%, higher than the national average of 8.3%. The president talked about how gas prices are affecting Americans. “Most of you have probably filled up your gas tank a time or two in the last week, and you've seen how quickly the price of gas is going up. A lot of you may have to drive a distance to work. Higher gas prices are like a tax straight out of your paycheck,” the president said. But he said that large corporations are hit even harder. 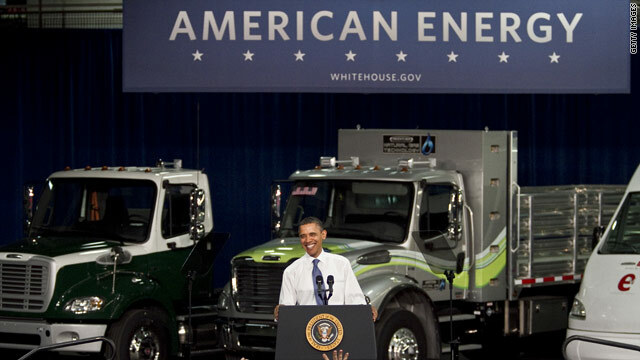 “For companies that operate a whole fleet of trucks, the higher costs can make a big difference in terms of the profitability of the company,” President Obama said. Although the trip to the Tar Heel state was an official visit and not a campaign event, it comes on the heels of visits by First Lady Michelle Obama and Vice President Joe Biden. Before the end of his remarks the president took a swipe at his critics, although he didn’t call out any of his opponents by name. Too bad we can't run vehicles off of hot air, Obama has an endless supply. Little late for the patent their Joey....Hot Air=Steam! Only Obama gets to make phony election year promises! Maybe we can run them there big trucks on algae!! It would be quite funny, if it weren't so sad! This from Reuter's two days ago. Jerry- The technology is here, today. Algae can thrive off of the pollution from our coal power stations, while emitting oxygen. The algae is the bi-product, which can be easily converted to biodiesel. The biggest obstacle is convincing gas guzzling, polluting naysayers. Know what I mean? GetReal – get real. What do you drive? It runs on algie? Sure... Lets print and spend billions more chasing this pipe dream while middle Americans suffers from high gas prices. Aviation fuel from Ohio algae tested by air force at Wright Patterson air base. yes...for $16.00 per gallon in lieu of about $2.00...big frigging deal! We tax payers took this on the chin as usual when obummer gets involoved in something. @jerry I would suggest you get a mule, since $2 a gallon gas is not going to happen again in your lifetime....that is some misguided pipe dream. The world demand is too great, and China is willing to pay more than $2 a gallon on any day of the week; which means the seller will sell it to the highest bidder...which is not you. jerry – Since Obama took office, nearly everyone's taxes have gone down. That's a fact, Jack. No get real ... mine have not. If you are talking about the payroll tax well all that is is the payments you make to the social security..... you are messing over the current seniors and short circuting your own retirement. Additionally the tax vurden is being shifter to bussiness...and that means you are paying those taxes anyway ... the only difference is who is collecting it. No coorporation is in bussiness to go broke payin taxes. If you think this has not happened before ... Look up the tax rate in the UK before and after Margaret Thatcher. All she did was shift the burden to business .. and the price was paid anyway by the consumer... not bussiness. "“The next time you hear some politician trotting out some three point plan for two dollar gas, you let him know we know better,” he said referring to Newt Gingrich’s plan. “Tell them we are tired of hearing phony election year promises that never come about.”"
Great...green fuel but when? We need to take care of ourselves NOW. And obama...get out of the way and quit your grandstanding, you have spend billions of our tax dollars in your failed green jobs mess. This is America and we were well on our way to deveooping green tech long before you were elected to anything...you moron. You are Moron body. Nobody is investing on green energy seriously before Obama. One got to have invest and initiation to start. It does'n't come itself. Understand Moron. Wrong.... Actually the Republicans were all for alternative energy research before...but now that it looks like alternatives just might work and in so doing jeopardize them being the ones who make it work, they are mocking all attempts. While Republicans are bashing it... Bill Gates is proposing more development. "Algae Biofuel Proposal, Now Mocked By Republicans, Used To Have Their Support "
sorry for saying this ... Raj you very good at name calling ... jeam amd I dom't agree on much, but we do agree on this one.. you are wrong. Republicans still believe in alternative energy ... they would do it more slowly so that the needed infrastructure would be there to support it ... and not rush into it so that potential problems could be avoided. WhatI am surprised about is that liberals are not screaming about the nuclear part of this speach. Before Obama, the oil and automotive companies actively bought and killed alternative energy patents, rather than make responsible investments, which would have been in the country's long term interests. What you are saying just does not make sense. If you think about it... Oil companies are in the business of making money. If there are patents that were pruchased and they were any good they would have been developed. If you have a vaible alternative that can make you money ... even if you provided oil why would you not set yourself/company for the future? Mores Lies from the Dictator. Did he talk about all the great work solyndra is doing? geeeee I hope so. Oil Consumption is projected to be at a 15 year low for 2012. So whiy is the price at the pump going up? President Obama also made reference in his speach that when demand goes down so do consumer prices... So why arent tthey going down ... our demand is at a 15 year low ... the dirty little secret is that additional taxes on oil is funding the reseach in the alternative energy field ... like Solyndra. Whose money is they want to tax more? I betcha whatever tax legislation they might get against the evil rich won't apply to them. So the man is advocating less dependence on oil when the rest of the world is raising theirs? Sounds like common sense to me. Just saw a clip of how the great FOX News pundits were saying rising gas prices during the Bush years were not his fault. I'm LMAO. We need less talk about new energy and more action on it. Obama "Oil is the fuel of the past". – Then why did I have to fill up today and why will I have to refill later this week? Because you are stuck in the past and do not consider the future. The truth is algae is not ready, The Volt was not ready, Solyndra wasn't ready! The point is renewables will come but rushing them to market will only result in more setbacks. Hybrid technology is not new so why is the Volt having so many issues? I have not yet heard once anything about the Nissan Leaf, which is 100% electric, having these many issues! Yet the Volt is getting taxpayer money and the Leaf did not, could that be the problem? Solar energy systems, photovoltaics, help solidify the necessary infrastructure for the growing trend of electric vehicles. Accelerate Solar (http://accelerate-solar.com) in Charlotte, NC provides free information about these types of residential and commercial solar power projects. All Obama does is keep talking..
Just a lot of talk. and Government funding for ridiculous ideas that cost the taxpayers money.